Question: What is a differential and why do Denver auto owners need to have it serviced? First of all – your vehicle has a differential. If it’s a rear wheel drive, your differential is on the back. 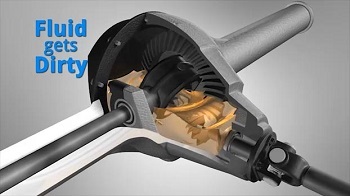 If it’s a front wheel drive, your differential is built into your transaxle (transmission). Denver auto owners with all wheel drive or four wheel drives will have differentials in the front and rear and maybe in between. When you are steering through a turn at an intersection in town, the wheels on the outside of the truck or car have to spin faster than the inside wheels because they have to travel a slightly longer distance through the curve. The differential compensates for these speed differences between the wheels. Because it is part of the vital equipment that transfers engine power to the wheels, the differential is working pretty hard. Differential fluid – an especially heavy-duty oil – cools, lubricates and protects the differential. It needs to be replaced on a schedule to remove metal shavings and other contaminants. Note: If you have a front wheel drive vehicle, replacing your transmission fluid takes care of your differential service needs. Differentials have become increasingly sophisticated for Denver auto owners. Rather than the simple mechanical devices of “the good old days”, they are more complicated and may actually be part of the key computer controlled stability system. This means they are more costly, so it pays for drivers to have them serviced on schedule at Express Car Care in Denver to avoid premature wear. Talk to your helpful Express Car Care technician. At Express Care, we provide quality automotice service including air condition service, transmission service and tire rotation. This was really interesting to learn about. I had no idea that my car had a differential or what it did. If I have an all wheel drive vehicle will I need to request that the differential fluid be replaced at my regular maintenance checks, or is that something that is always done? Are they expensive to replace if the get damaged? Thank you for bringing this to my attention!